 Tactics to Manage Herbicide-Resistant Weeds - Jared Goplen, University of Minnesota, August 2017.  Corn Eyespot - Damon Smith, University of Wisconsin-Madison, July 2016.  Increasing Importance of Sulfur for Field Crops - John Sawyer, Iowa State University, July 2016.  Cry1F Resistance in Fall Armyworm (Spodoptera frugiperda) - Ana MarÃ­a VÃ©lez, University of Nebraska-Lincoln, May 2016.  Advances in Prescriptive Agriculture & Big Data - John Fulton, The Ohio State University, April 2016.  Gossâ€™s Bacterial Wilt and Leaf Blight of Corn - Tamra Jackson-Ziems, University of Nebraskaâ€“Lincoln, April 2016. Please include the word "corn" in your search. This resource is public access.  Grain Storage Equipment Preparation - South Dakota State University - 1 October 2018.  How Do I Manage Insects in My Stored Grain? - South Dakota State University - 24 September 2018.  Tips for Harvest Management & Preserving Grain Quality in Corn - University of Illinois at Urbana-Champaign - 18 September 2018. 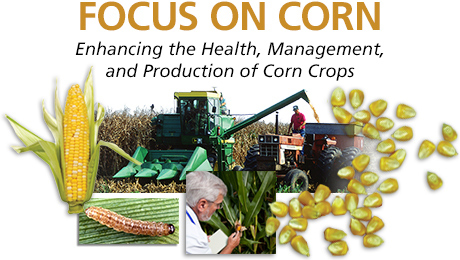  Stalk Rot Diseases in Nebraska Corn Fields - University of Nebraska-Lincoln - 13 September 2018.  Some Georgia Farmers Harvesting Corn Later This Year - University of Georgia - 23 August 2018.  You â€œMiteâ€� Want to Scout Drought-Stressed Crops - Iowa State University - 6 August 2018.  Japanese Beetles in Corn and Soybean - Ohio State University - 24 July 2018.  Identifying, Scouting and Management of Bacterial Leaf Streak - Iowa State University - 20 July 2018.  Managing Japanese Beetles in Corn and Soybean - University of Illinois at Urbana-Champaign - 19 July 2018.  MU Extension Confirms First Report of Southern Rust in U.S. This Season - University of Missouri - 11 July 2018.  Weather Conditions Ripe for Physoderma Brown Spot and Node Rot and Gray Leaf Spot - Iowa State University - 1 July 2018.  Seeing Stunted Yellowing Corn in Patches? - South Dakota State University - 18 June 2018.  Volunteer Corn Impacts Yield - Illinois Soybean Association - 18 June 2018.  Corn With Straw Mulch Builds Yield, Soil Carbon - American Society of Agronomy - 25 April 2018.  Fertilization Can Help With Cool Soils and Late Planting Dates - Iowa State University - 23 April 2018.  Seedcorn Maggot Active in Southern Iowa - Iowa State University - 23 April 2018.  Corn Planting, Progress Hindered by Cold, Rain - Mississippi State University - 20 April 2018.  Early-Season Soybean Management for 2018 - University of Illinois at Urbana-Champaign - 19 April 2018.  A Late Spring - Nitrogen Considerations - Iowa State University - 17 April 2018.  Planting Date - Stay the Course - Illinois Soybean Association - 15 April 2018.  Faba Fix for Cornâ€™s Nitrogen Need - American Society of Agronomy - 11 April 2018.  Corn Responds to Phosphorus Starter Fertilizer - North Dakota State University - 5 April 2018.  Managing Corn Rootworm Populations in Illinois: Considerations for 2018 - University of Illinois at Urbana-Champaign - 8 March 2018.  Should We Be Spraying Fungicides on Corn at V12? - Iowa State University - 8 February 2018.